Calligraphy set. Discover Calligraphy and Illumination pairs dynamic art instruction with quality materials to provide a seamless creative experience for the aspiring fine artist. The beautiful project book guides artists stroke by stroke through a variety of writing styles, from the stately black letter alphabet to an elegant italic hand. And it even features instruction on the art of letter illumination, a centuries-old practice with modern-day appeal. In addition, this set includes all the essential tools needed to embark on an exciting exploration of this elegant art form! 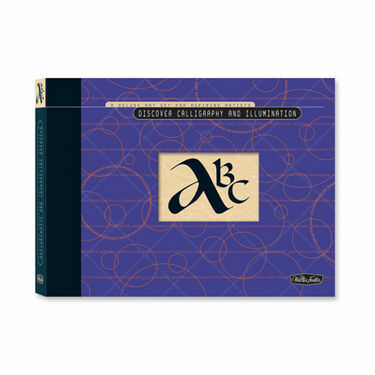 Hardcover 13.75" x 9.75" x 2" case includes 40-page paperback book, 5 pen nibs, nib holder, pen nib reservoir, black ink, 2 round paintbrushes, 5 gouache paints, gold paint, ceramic mixing palette, hot-press watercolor paper, and art paper.